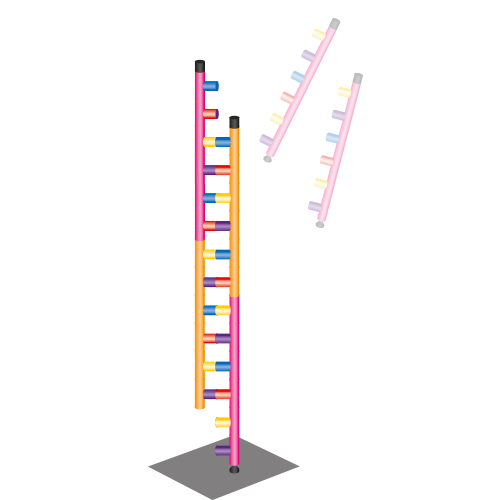 For more than three decades, DNA has been synthesised using a chemical process in which individual oligonucleotides (oligos) are constructed one base at a time and are then combined to create longer, double-stranded DNA. Once the DNA has been created, it is sequenced to determine if synthesis has been achieved accurately. Despite various improvements in the approach, there remain problems which are particularly significant in the synthesis of longer DNA. Current techniques incorporate random errors, which can render the DNA useless, and finding error-free DNA is a time-consuming task requiring further analysis and sequencing. In addition, error-free DNA becomes increasingly rare as the length of the DNA increases, creating challenges for the use of DNA in synthetic biology where the ability to access high-fidelity DNA at scale is an important requirement. Evonetix has developed and patented a novel approach that manages both the synthesis and the assembly of high-fidelity DNA in a streamlined and efficient process. A platform that is highly scalable, but still permits exquisite control at each site of synthesis. 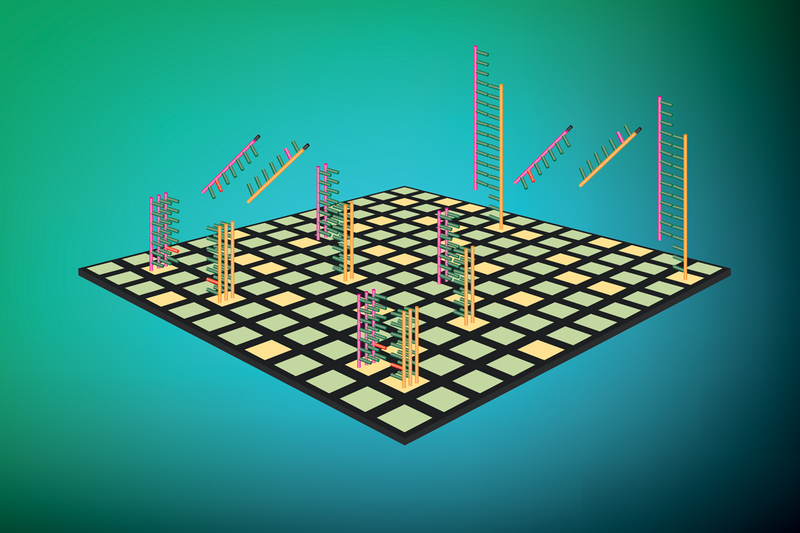 The ability to assemble high-fidelity DNA molecules using a process of error detection throughout assembly. 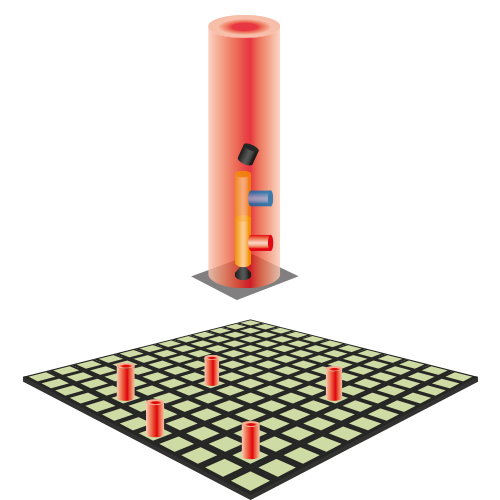 Evonetix has developed a unique silicon chip that allows large-scale synthesis to occur in parallel. Rather than creating different oligos in physically separated wells, Evonetix uses thermal engineering to independently control the sequence of oligos synthesised at each reaction site. Evonetix’s innovative chip technology allows thousands of these reaction sites to operate simultaneously without impacting any of their neighbours, revolutionising the existing method and allowing for faster and more efficient DNA synthesis. By controlling the temperature of each reaction site, the growing oligos can be selectively decapped, preparing them for new bases to be added according to the planned sequence. The reagent for a specific base is introduced to the flow cell, where it will be incorporated onto any oligos that have been previously decapped. As reagents for each of the four bases (A, C, G, T) are introduced sequentially, the timing of thermal decapping enables a different sequence to be synthesised at each of the reaction sites. 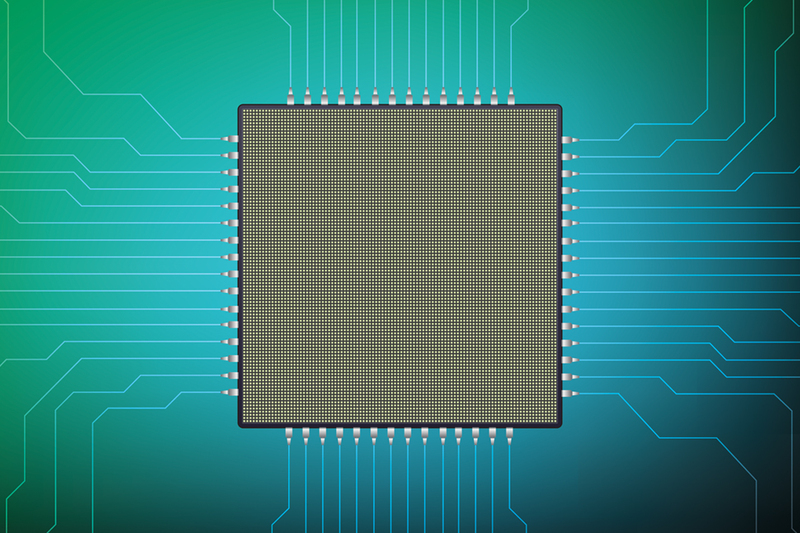 Manufactured using innovative semiconductor processing, the chip can provide truly independent thermal control at each miniaturised reaction site within a common flow cell. As reagents for each of the four bases are cycled through the flow cell, thermal control of the decapping reaction is used to dictate whether or not the oligo incorporates each base (which can be done either through the traditional chemical method or using an enzymatic approach). Evonetix’s own proprietary thermal control chemistry makes decapping exceptionally sensitive to temperature. An individual sequence can therefore be synthesised at each reaction site. This method allows for the synthesis to take place in a highly parallel process, with streamlined fluidics. Large numbers of oligos are synthesised in parallel, resulting in a new-found speed and reduced reagent usage. 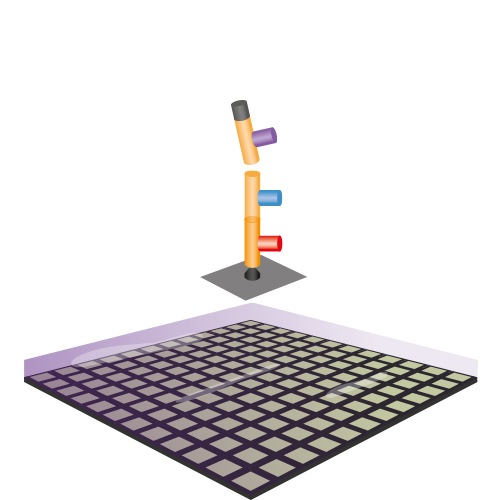 The silicon chip also has the extraordinary capability to test each oligo for accuracy before it is assembled into DNA. With the silicon chip’s ability to precisely and independently control the temperature of individual reaction sites, Evonetix is able to detect and remove oligos with errors found on the chip. This saves the laborious work that would otherwise be required to search for and assemble error-free DNA. One of the most expensive and time-consuming aspects of synthesising DNA is the assembly process. Biologists are required to extract, clone and assess strands on an individual basis, with no way of knowing their effectiveness until the process is complete. 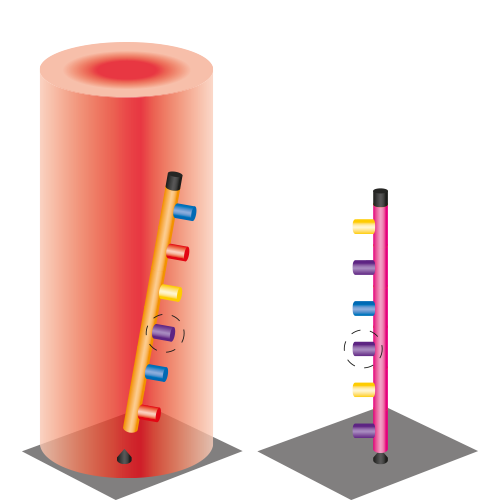 Evonetix’s thermal control technology allows us to test each strand on an individual basis for suitability, removing error-containing oligos before they are incorporated into longer, double-stranded DNA. As the oligo is released from the surface using temperature control, it is transported to the next in sequence where the two will hybridise to form a short strand of DNA. Any errors create a flawed bond, resulting in the strands separating at a lower temperature than they would for a perfect match. Holding the temperature just below this point enables the chip to purify the population of oligos. As the oligos containing errors are removed, the short DNA strands with an acceptable level of accuracy are transported across to the next reaction site in sequence, further hybridising to create longer strands. The binary assembly process is unique to Evonetix and is central to revolutionising the established methods. 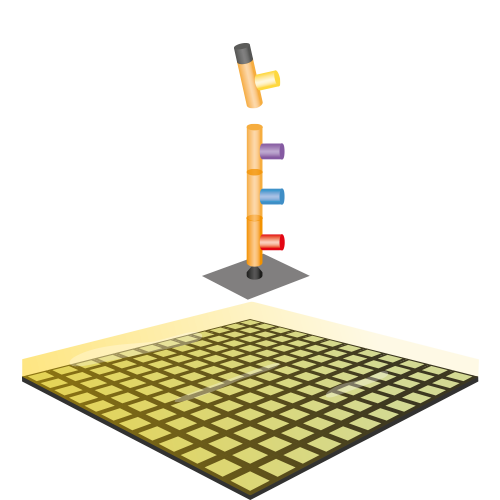 By applying heat to the reaction sites as required, the Evonetix silicon chip can remove oligos containing errors throughout the assembly process. Precise temperature control is used to identify incorrect sequence pairing, preventing the incorporation of any oligos that contain errors. 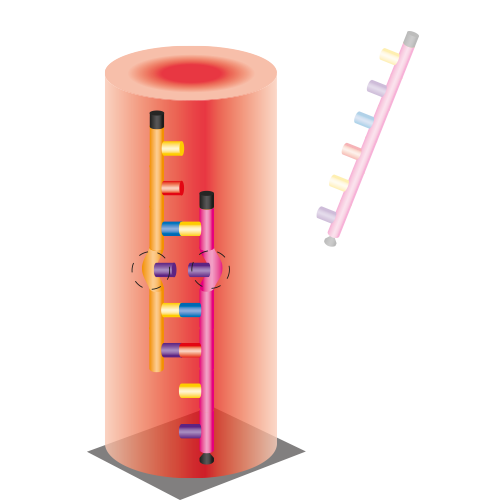 By removing incorrect oligos, the chip ensures that only accurate strands make it through to the next stage of assembly, massively increasing the yield of error-free DNA.